▪ Mesoamerican legends are not congruent with the idea that Book of Mormon lands are in that region. ▪ The Guatemalan Zarahemla hypothesis originated with an 1842 Mormon newspaper article published ------ during Joseph Smith's public absence. ▪ Guatemalan Book of Mormon geography misrepresents Hebrew directions. The LDS Scriptures, C-D ---------ROM Resource Edition can help Latter-day Saints understand Hebrew directions. Many Latter-day Saints are eager to see in these legends a parallel to the great destruction, three days of smoky darkness and the appearance of Jesus Christ in America's Promised Land, as described in the Book of Mormon. The details of the accounts, however, do not support the idea that Book of Mormon lands are located in Mexico and Guatemala. For instance, according to the Book of Mormon, the great destruction and three days of darkness occurred in the beginning of the year, at the time of Christ's death. (Helaman 14:20-21) Anciently the Hebrew year began in the spring. Israelites were required to sacrifice the Passover lamb, observe the feast of unleavened bread, and offer a "first-fruits" wave offering of barley at this season. (Deuteronomy 16:1, Leviticus 23:5-11, 2 Nephi 2:8-9, Jacob 4:11) The seasons of Central America consist of a wet and a dry season, year round. Unlike Mesoamerican accounts which tell of Quetzalcoatl's arrival many years after the terrible earthquake, according to the Book of Mormon, Christ descended from heaven towards the end of the same year as the great destruction. (3 Nephi 8:5; 10:18) The darkness in Book of Mormon lands was so profound that no light of any kind could be seen, including starlight, (3 Nephi 8:22) and there were countless fatalities caused by the quaking of the earth. Despite the tabloid origin of the Guatemalan Zarahemla hypothesis, certain LDS writers are bent on selling some version of it. They have been undaunted even though the Mesoamerican setting conflicts with the location of Cumorah set forth in LDS scripture, and even though certain General Authorities of the Church have publicly opposed the notion that "Cumorah" is somewhere in Central America.3, 4, 5 Now days, Mormon revisionists are willing to second guess the scriptural location of Cumorah as well as Joseph Smith's knowledge of Nephite lands and civilization. The foremost Central American setting alleges "plausible locations in Mesoamerica for Book of Mormon places".6 One of the meanings of the word "plausible" is: "Having an appearance or show of truth, reasonableness, or worth; apparently acceptable or trustworthy (but often with implications of mere appearance); fair-seeming, specious" (Oxford Dictionary). Before any Mesoamerican setting can even begin to qualify as a possible setting for Book of Mormon lands it has got to get its directions right with the book. The "small neck of land" is a key feature in Book of Mormon geography. (Alma 22:32) Once you cast in your lot with those who say that Zarahemla is in Guatemala, you become rather limited in terms of the pick of isthmuses to label as "the small neck". Most in the Guatemalan geography camp feel compelled to promote the 125 mile wide Isthmus of Tehuantepec (tāwntāpĕk) as the "small neck of land". But in order for this wide Mesoamerican isthmus to pass as the Book of Mormons "small" or "narrow neck", with its "narrow pass" or "passage" it has got to have water "on the west and on the east." (Alma 50:34; 63:5, Mormon 2:29) Tehuantepec is situated between the Gulf of Mexico on the north and the Pacific Ocean on the south. The location of seas is a problem in general with the "plausible" map. At places where the sea is supposed to be west (according to the Book of Mormon) it is south or south west on the "plausible" map. The setting has similar problems locating and orienting other seas named in the Book of Mormon. Directional difficulties have not kept advocates of a Guatemalan Zarahemla from publishing their geographies. How do they handle the direction problems? Intentional or not, some resort to an intellectual smoke screen, arguing that the whole business of direction is really quite relative after all. Examples from several non-Israelite cultures are cited. Their shifty compass is certainly not the moral Liahona (sacred Book of Mormon compass) that Church leaders want members to follow in their personal lives. Of course coordinate systems are relative. The focus should be on how devout Israelites would have coordinated directions outside Canaan. There is a growing number of LDS who stand by their common sense and object to south being west, north being east. Attempts have been made to confuse or belittle the common sense of these people. For instance, laymen are accused of naively imposing European coordinates on an ancient culture, despite the fact that these coordinates seem to work fine for the Bible. Finally advocates of the Guatemalan hypothesis cleverly misrepresent Israelite directions. They are seldom called on it because not many people can actually read the "Old Testament" in Hebrew. Of course, if Book of Mormon sites and directions had fit nicely into the Mesoamerican scheme, Guatemalan Zarahemla advocates would never have resorted to such "scholarly" tactics. "Suppose, for a moment, that you were with Lehi's party as it arrived on the Pacific coast of Central America. By western civilization's general present-day terminology, the shore would be oriented approximately northwest-southeast. When you said yamah, intending "westward," the term would mean literally "seaward," although the water would actually be "behind your back" to our southwest. Further, the first step you took inland, away from the sea, would be "eastward" ("to the fore," literally) in Hebrew; we today would say the motion had been northeastward. In the absence of a conscious group decision to shift the sense of their Hebrew direction terms by 45 degrees or more, the little group of colonists would have fallen into a new directional language pattern as their Semitic-language model encountered the new setting." Now for the full truth: "Yam" in Hebrew does mean "sea", but "yam" doesn't have to mean Ocean. Large inland bodies of water can also be called "seas" in Hebrew. Folks familiar with Bible lands can easily think of a couple of examples. The Book of Mormon mentions a "sea east" a "sea west" a "sea north" a "sea south" a "west sea, south" and a "place where the sea divides the land". There is no reason to believe that all of these seas refer to oceanic bodies of water. John Sorenson and company would have us believe that Lehi's party of Israelites crossed the Arabian Sea, the Indian Ocean and the vast Pacific Ocean to finally land on a Central American coast. What a lot of fresh water they would have had to store on board! Never mind the long way to the Americas, Jewish minds want to know why the LORD would lead a colony of Israelites to a place that does not accommodate the Torah (Law of Moses) very well in terms of the requisite seasons, grains, fruits and animal life. Fortunately for Sorenson and his advocacy they don't have to sell many Jewish thinkers on the idea, but they do have to sell Latter-day Saints on skewed directions. But which way is west? Sorenson argues that when Lehi's party stepped ashore (presumably near El Salvador) with their backs to the Pacific Ocean, that this quite readily and endemically established "west" for the colony. Regardless of the fact that the Pacific Ocean lies south of this part of Central America, Sorenson would have us believe that because the sea was behind them, that the Hebrew word "yamah", "seaward" in the New World came to designate "west". Never mind the sun! With the Pacific behind, "forward" then came to designate "east", even though this direction really points northward. What is wrong with Sorenson's argument? It is entirely specious and misleading, scripturally speaking. The Hebrew word "qedem" means front or before, it is sometimes translated east. The Hebrew word "ahor" means back, after or hinder and can, in some instances, be interpreted west. (Y'shaYahu 9:11 in the Hebrew Bible, Isaiah 9:12 in the KJV) The Dead Sea is sometimes called the "former sea" or "eastern sea" while the Mediterranean is sometimes called the "back sea", "hinder sea" or "western sea". (Zechariah 14:8) Relative to Jerusalem, the Mediterranean is west, as the sun sets, and the Dead Sea (Salt Sea) lies east - toward sunrise. The LORD said to Joshua, "unto the great sea toward the going down of the sun, shall be your coast." (Joshua 1:4) It makes sense in the land of Israel to equate seaward with "westward". (Genesis 13:14) The Hebrew dictionary in the LDS RESOURCE EDITION of THE SCRIPTURES notes that seaward, pronounced "yamah" is locally "westward". In other words, seaward is "westward" relative to the land of Israel. Interpreting seaward as west elsewhere risks taking things out of context. There are other verses in Hebrew scripture such as Numbers 3:38 and Joshua 19:13, showing that the reference frame for which before is interpreted as east is standing before the rising sun. This Promised Land reference frame results in one's right hand directing south, one's left hand directing north, and if there is a sea nearby, opposite the rising sun, with a coastline running north and south, then yamah (seaward), is west. In any event ahor (behind), same as maarav (place of sunset) appropriately names west. Sorenson asserts that Israelites, because of their language, were inclined to confound the direction towards a sea with "west". Yet Hebrew scripture successfully distinguishes between the direction towards an "east sea" and the direction towards a sea on the west. (Joel 2:20) Sorenson doesn't elaborate on the skewed "west" which he attributes to Lehi's landing, in comparison to the "seaward" of Mulek's landing. (Helaman 6:10) Using Sorenson's logic, shouldn't we conclude that Mulek's "seaward" was also regarded as "west"? In the recent translation of Veytia's work, Ancient America Rediscovered, there are several references to Mesoamerican people observing the sun for a sense of direction. (pg 49 and pp 52-53) This shouldn't surprise us. By the sun, the ancient peoples of Central America would have perceived the region of Tehuantepec as situated between northern and southern seas. It does not help their confused argument when LDS Tehuantepec advocates point out that both Mayans and Hebrews designated south "on the right hand" and north "on the left". As explained, this reference frame results from standing facing east sunrise! 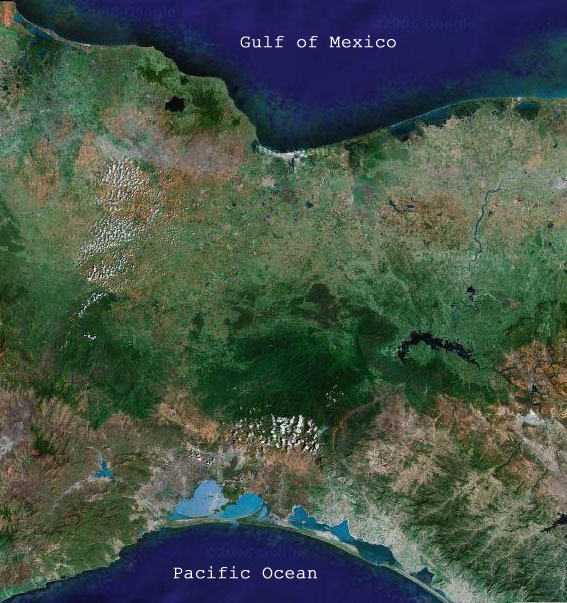 Peering through the intellectual smoke screen put up by Tehuantepec advocates, the fact remains, to insist that the seas north and south of the Isthmus of Tehuantepec can somehow be seen as "east" and "west" respectively, is to ignore the heavens. A colony of devout Israelites is not likely to do such a thing. Hebrew scripture clearly shows that when Israelites refer to "the sea on the east" (Joshua 12:3) their "east" (mizrah) faces sunrise. Seasonal variations in the position of the rising sun cannot rescue the Tehuantepec narrow neck idea from its egregious coordinates. Latter-day Saints expect the definition of "eastward" in connection with Lehi's journey in Arabia to be consistent with Israelite east. Why should Nephi's followers violate the Law of Moses and orient their altars differently in America? (1 Nephi 16:13-14; 17:1) Incidentally, there is a verse in Hebrew scripture in which "from the sea" can be interpreted to mean "from the south"; possibly referring to the Arabian Sea and not the Mediterranean. (Psalm 107:3) Outside of the Land of Israel, Lehi and Nephi were not constrained to think of seaward as west. Guatemalan Book of Mormon geography misrepresents Hebrew directions plain and simple. Latter-day Saints need only use the LDS Scriptures CD ROM Resource Edition to see for themselves. Use the transliterated Hebrew / English version of the Old Testament and the click-on Hebrew Dictionary. Israelite east faces sunrise.7 The Middle East department of any reputable university will back up this fact. As for Israelite directions in Book of Mormon covenant lands, Phyllis Carol Olive at www.bookofmormonlands.com is one LDS author on the subject, willing to use the right compass. Nations", Times and Seasons, Vol. 3, No 16, June 15, 1842; pg 818. No 18, July 15, 1842; pg 858. 3. Joseph Fielding Smith, Doctrines of Salvation, Volume 3, pp. 233-234. 4. Bruce R. McConkie, CUMORAH, Mormon Doctrine, pg 175. Improvement Era, 1953; pp. 83-84. 6. John L. Sorenson, An Ancient American Setting for the Book of Mormon. 7. MIZRAH; SUN, Encyclopedia Judaica. The author has a Masters degree in Physics from the University of Utah and has studied Hebrew in Israel and at the University of Utah. He conferred with Dr. Harris Lenowitz (U of U Middle East Department) on the subject of Israelite directions.